I discovered this blog randomly while checking on the common spelling of "crummy" versus "crumby" for my previous post. 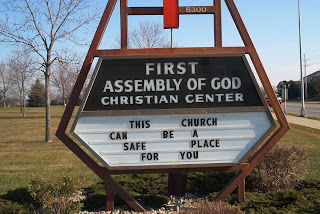 The mission statement appears to be "critical analysis of critically bad church signs." I don't know how some of these people do it, how they manage to sustain their interest in such a tight, niche idea such as this, but God bless them. Check out the latest church sign madness or sort through THREE YEARS (!!!) of archives by CLICKING HERE.